The Korean culture is quite unique in its approach to food. Food seems to permeate every aspect of life. If you have watched a Korean drama or movie you will undoubtedly have noticed that in at least one scene someone is eating. There are even entire films and dramas based around Korean cuisine. For Koreans, food is much more than something to fill the belly – it provides taste, medicine, and a connection to the sense of nationality. Below we have listed 5 dishes that, in our opinion, are truly the most delicious; these are foods that every Westerner will love as much as Koreans. Soon-dubu Jji-gae is a Korean stew, called Jji-gae which is thicker than a soup but thinner than a porridge. When cooked in the traditional way in an earthenware pot, all of the cooking is done in just the one dish. This makes it very easy to clean up afterwards. It starts with a delicious fish stock or a beef stock to deepen the flavour then finished off with fresh shell fish (or beef depending on your choice), hot pepper flakes, silken tofu, and eggs which are optional. You can have it blisteringly hot or very mild which is particularly handy if you are cooking for children who can’t stomach their food too spicy. This is a dish everyone should try – it is really one of the nicest ways to introduce someone to tofu which picks up all of the flavours of the stew while adding a soft comforting texture. Eat it with rice and side dishes for a complete meal! Click here to view Soon-dubu Jji-gae on SURA Menu. When you visit S. Korea, you will notice that Korean Rice Cakes a.k.a Dduk-bokkie is one of the most beloved snacks especially where young people hang around. In large Korean cities like Seoul, the streets are filled with vendors selling their own special recipe versions of the most popular street food. Dduk-bokkie is one of the most popular and it comes in various styles. The sauce is spicy but it is also very sweet and packed with an immense amount of flavour. 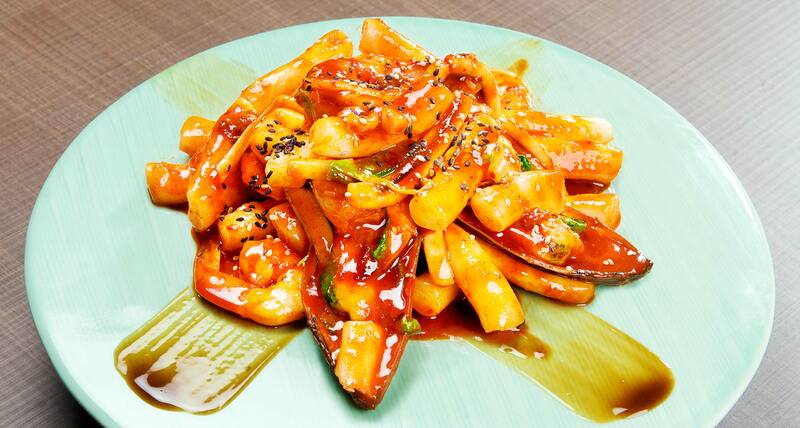 The spiciness is cut by the long cylindrical rice cakes which, when cooked, become chewy and soft. The rice cakes are probably the most unusual part of the recipe for most westerners but when they try it – they’ll love it. Click here to view Korean Rice Cakes on SURA Menu. Japchae is one of the most popular dishes at family-gatherings in S. Korea, and now it has become wildly popular outside of Korea. When you taste it you will understand why. Click here to view Japchae on SURA Menu. Bulgogi is an extremely versatile way of preparing beef; but this dish is the one most westerners have sampled at Korean restaurants. Typically in the west we eat bulgogi at a DIY Korean barbecue. But in S. Korea this is just one of many ways. It can be made into a stew or as the basis for other dishes. It is such a versatile marinated meat that you could even use it to replace pulled pork in a western style sandwich (And They do!!). Bulgogi is very thinly sliced beef which is marinated in a sauce made from pear juice, garlic, soy sauce, and many other things. There are as many recipes as there are uses. The end result is a delicious sweet, deeply savoury, and soft slice of meat. Of course the most popular way to eat Bulgogi is to wrap it with a small amount of rice and dipping sauce in a icy lettuce leaf. It is also incredibly low fat and very healthy. Click here to view Bulgogi on SURA Menu. If you have never tried Korean food before and want to try only one dish from this list, let it be Dolsot Bibim–bap. In Korean, “dolsot” means earthenware pot, “bibim” means mixed, and “bap” means steamed rice. All of the ingredients except the meat, which is optional, are prepared in advance so you can add them at room temperature to the top of hot steamed rice. You then quickly stir-fry and add the meat and a just cooked sunny-side up egg to the top. Dolsot Bibim–bap is usually served with a spicy sauce made from Korean hot pepper paste, a.k.a Gochu-jang, which you can add to your liking – allowing you to control how spicy it is going to be. You then use your spoon to mix them all until all the ingredients are properly mixed together. The trick then is to see how much you can fit in your mouth in one go! This really would be a taste sensation for a new comer and we’d argue that Dolsot Bibim–bap is impossible not to fall in love at first bite! Click here to view Dolsot Bibim–bap on SURA Menu.